Sitting vacant now for almost a year, the former Handlebar music venue on Stone Avenue is about to get a makeover. After plans for a boutique bowling alley and entertainment venue from Charleston-based The Alley were put on hold, developer Ron Rallis found a new tenant with new plans for the property. Howard Dozier and his business partner, Paul Talley, who also own The Comedy Zone, Kilpatrick’s Public House and Pour Lounge in downtown Greenville, have signed a lease on the former Handlebar property. Construction is expected to begin this month on the Revel Event Center, which will occupy the 8,500-square-foot upstairs space of the former Handlebar property. The additional 8,500 square feet downstairs will follow along later this summer, and it’s not out of the question for it to still be a boutique bowling alley, said Dozier. Revel will be a flexible event space that can host approximately 350 people for weddings, receptions, parties and meetings. “It will be a world-class event space complete with the latest technology, modern sound/light/video, an on-site full-service catering company, full bar and a garden-style patio area,” said Dozier. Dozier said that Greenville is growing at such a rapid pace that it is quickly outgrowing the number of independent, freestanding (not a ballroom in a hotel) event spaces that currently exists. He also anticipates being able to attract larger comedy acts to perform at Revel, such as Amy Schumer and Chris Tucker, who won’t come to the smaller Comedy Zone venue. “It’ll put us in a different market,” he said. Plans for the remodel will accent the natural beauty of the space and re-expose its industrial and 1920s warehouse-like elements, much of which has been covered up for decades by soundproofing and other live music-related materials, he said. 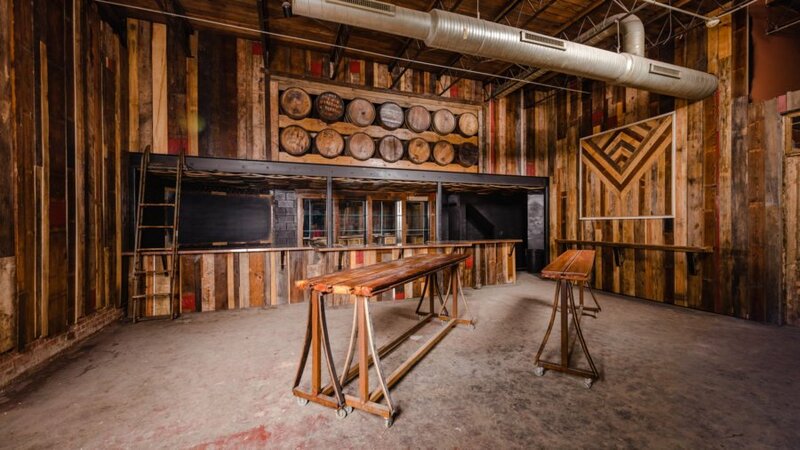 “Brick-lined walls, original warehouse windows, barn doors and handcrafted lighting are just a few of the terrific things we will introduce as we create an event space that will be on par with any event space in the entire Southeast,” he said. Concerns from residents at last year’s neighborhood meetings included parking and noise. Dozier said they will have a sound engineer come in and make sure that “everything is not too loud for the neighbors.” He also added that they won’t have the concert-grade sound equipment The Alley team expected to have; it’ll just be enough for a wedding band, he said. As for parking, there is some on-site parking available, and lots have been secured across the street. There will also be valet parking available. Revel is expected to open spring 2016. More details on the downstairs plans will be released in the coming months.